EPCLUSA is indicated for the treatment of adults with chronic hepatitis C virus (HCV) GT 1-6 infection without cirrhosis or with compensated cirrhosis and in combination with ribavirin for those with decompensated cirrhosis. 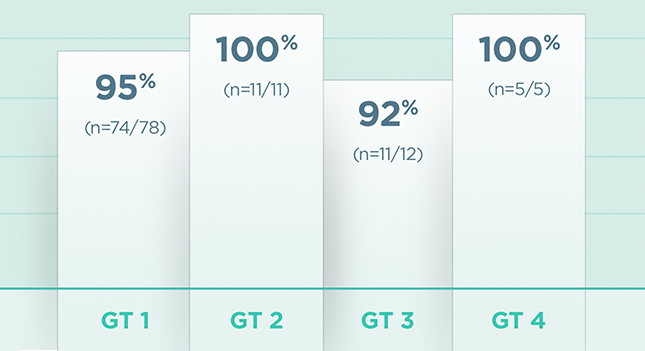 bCompleter efficacy analysis includes all patients who were randomized, completed assigned study treatment, and had HCV RNA data observed at post-treatment Week 12 or thereafter. EPCLUSA US full Prescribing Information. Gilead Sciences, Inc. Foster City, CA. November 2017. Lawitz E, Bourlière M, Han L, et al. Treatment with SOF/VEL or SOF/VEL/VOX is well tolerated and results in high SVR12 in genotype 1–6 HCV–infected patients with minimal fibrosis: a retrospective analysis of the ASTRAL and POLARIS clinical studies. Poster presented at: International Liver Congress™, 19-23 April 2017: Amsterdam, the Netherlands. Landis CS, Sulkowski MS, Reau N, et al. Safety and efficacy of velpatasvir and sofosbuvir-based regimens for the treatment of HCV genotype 1-6: results of the HCV-TARGET study. Poster presented at: AASLD The Liver Meeting®, October 20-24, 2017: Washington, DC. Mangia A, Piazzolla V, Losappio R, et al. High SVR rates in patients with and without cirrhosis treated in real life with sofosbuvir/velpatasvir (SOF/VEL) combination for 12 weeks without ribavirin (RBV). Poster presented at The International Liver Congress 2018, European Association for the Study of the Liver (EASL), 11-15 April 2018: Paris, France. US Department of Health and Human Services, Center for Drug Evaluation and Research. Guidance for industry. Chronic hepatitis C virus infection: developing direct-acting antiviral drugs for treatment. November 2017. Test all patients for evidence of current or prior hepatitis B virus (HBV) infection before initiating treatment with EPCLUSA. HBV reactivation has been reported in HCV/HBV coinfected patients who were undergoing or had completed treatment with HCV direct acting antivirals (DAAs) and were not receiving HBV antiviral therapy. Some cases have resulted in fulminant hepatitis, hepatic failure, and death. Cases have been reported in patients who are HBsAg positive, in patients with serologic evidence of resolved HBV, and also in patients receiving certain immunosuppressant or chemotherapeutic agents; the risk of HBV reactivation associated with treatment with HCV DAAs may be increased in patients taking these other agents. Monitor HCV/HBV coinfected patients for hepatitis flare or HBV reactivation during HCV treatment and post-treatment follow-up. Initiate appropriate patient management for HBV infection as clinically indicated. Please see full Prescribing Information for EPCLUSA, including BOXED WARNING. The information contained on this site is intended for audiences in the United States only. The content on this site may not apply to non-US audiences, as regulatory control, legal requirements, and/or medical practices may vary in other countries. Photos not of actual patients. EPCLUSA, the EPCLUSA logo, SUPPORT PATH, GILEAD and the GILEAD logo are trademarks of Gilead Sciences, Inc., or its related companies. All other trademarks referenced herein are the property of their respective owners. You are now leaving the EPCLUSA healthcare professional website. 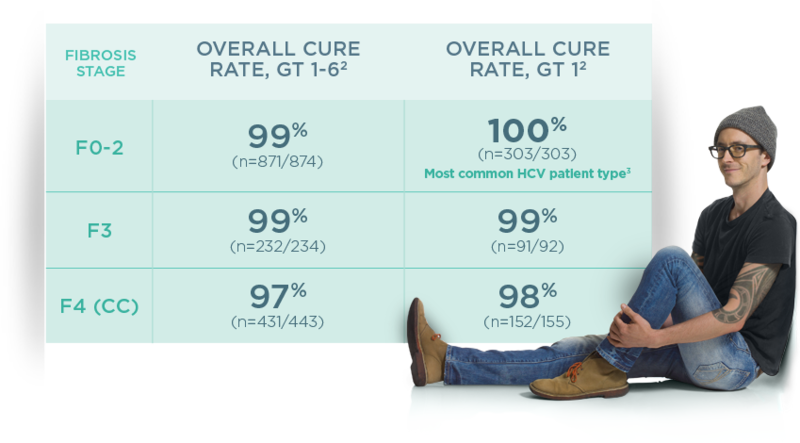 ASTRAL-5 Study Design: Open-label trial in TN and TE GT 1-4 subjects with HCV/HIV-1 coinfection without cirrhosis or with compensated cirrhosis (N=106). Subjects received EPCLUSA for 12 weeks. Lawitz E, Bourlière M, Han L, et al. Poster presented at: International Liver Congress™, 19-23 April 2017: Amsterdam, the Netherlands. Real-world data are observational in nature and are not based on controlled clinical studies. Results from the HCV-TARGET and Puglia studies may differ from those observed in clinical practice and are not presented in the EPCLUSA prescribing information. The HCV-TARGET study was supported by Gilead Sciences, Inc.
Terrault NA, Zeuzem S, Di Bisceglie AM, et al. Effectiveness of ledipasvir-sofosbuvir combination in patients with hepatitis C virus infection and factors associated with sustained virologic response. Gastroenterology. 2016;151:1131-1140.